How do I copy an assessment in Gauge? Admins and teachers can copy assessments in Gauge. Copied assessments include all content and settings from the original assessment. Reports and deployments are not copied. Copied assessments are titled Copy of [Original Assessment Title] by default. It is recommended that you create a new title to avoid confusion with the original assessment. Admins can copy all assessments in their institution. Teachers can only copy assessments that they have authored. 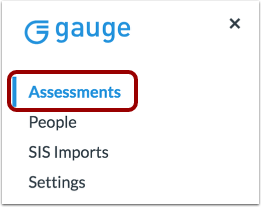 In the Gauge Navigation Menu, click the Assessments link. Find the assessment you want to copy . Then click the Copy icon . Enter a title for your assessment in the Title field . If you do not enter a name, the assessment will be titled Copy of [Original Assessment Title] by default. 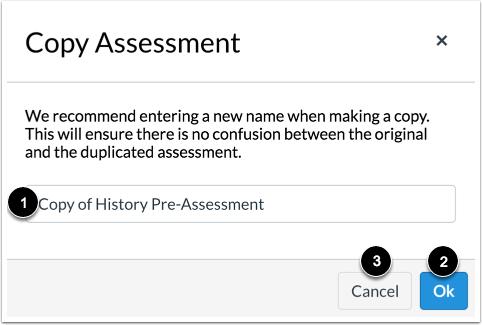 To save your assessment title, click the Ok button. To cancel the assessment copy, click the Cancel button . View your copied assessment . Assessment copies are indicated by a Dot icon . Previous Topic:How do I create an assessment in Gauge? Next Topic:How do I import an assessment from a QTI package in Gauge? Table of Contents > Admins & Teachers > How do I copy an assessment in Gauge?